Ganesha is one of the revered deity of Hindus. He enjoys a special place in the hearts of the Hindus because of his appearance and tales attached to it. That is why those who love Ganesha and art both, resort to buying Ganesha paintings and idols to spruce their spaces. However, little do they know the meaning of various postures? Hence, in this blog, we tell you the meaning of different postures of Ganesha, so the next time you buy Ganesha paintings or idols, you know what it means and how you can harness the benefits of Feng Shui from them. Take a look. The paintings and idols that have Ganesha in a dancing position are known as Nritya Ganesha. Mostly, Ganesha is shown dancing with left leg raised and the other one resting on the ground. Often known as the dance of destruction, it is believed that Ganesha used to dance in front of his parents to entertain them with all grace and composure. Some of the dancing postures also show him on his vaahan- The Mouse. This is a way of showing the world that even the timid get the valor and strength after seeking the blessings of Ganesha. This posture is also known as ‘Abhanga’. The pose showcases firmness and righteousness. Moreover, he is shown standing while keeping one of his legs on the ground and the other on the mouse. This makes him look huge because of his belly. Though there are some variations in his sitting posture, the most common one is known as ‘Lalitasana’. He is generally seen sitting either on some throne or a lotus flower. One of his legs is folded and the other one is resting. The pose shows him meditating. One leg on the ground denotes that even at the time of meditation he is aware of the happenings of the world and is there for his devotees. In many divine Ganesha paintings and idols, the almighty is shown in this posture. He is shown lying on a throne with a pillow underneath his head for extra relaxation. This posture signifies the royalty and prosperity. Artefacts with this posture are extremely popular and are always high in demand. The curve of the trunk signifies celestial sound of Om. Also, the grown trunk shows intellectuality level and wisdom. Remember to buy an artwork that has the trunk facing left and not the right side. So, be sure the next time you buy Ganesha painting or idol that you buy it according to the meaning that each posture has. Buy one and attract auspiciousness in your space today. 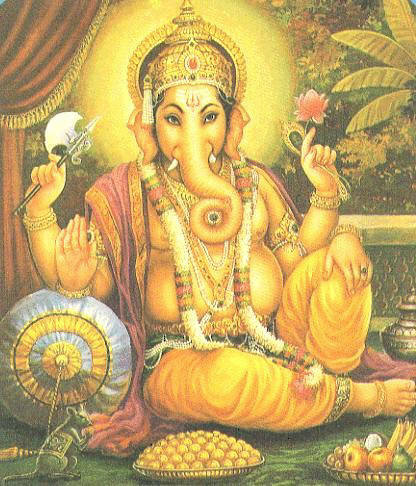 Also, share this blog with other art and Ganesha lover.